Christmas was awesome.The hubs and I had a great time hanging out with our family, eating at Five Guys for the first time (super yummy) and opening presents. We got so spoiled this year. I got an awesome new clock, a food processor and Kurtis got a new XBOX 360 to replace the one that got stolen last year( he was so excited.) But really the best part is watching the little ones open their presents, they get so excited and I love watching them enjoy all of the stuff that we give them. We did Christmas Eve at my Grandma's house which always involves good food, puzzles and my Aunts exchange student, this year she was from Spain. Kurtis spent the evening explaining the concept of one family practicing many different religions, for example Kurtis and I are LDS, My Aunt and Uncle are Jewish, my cousin is Methodist and married to a Catholic. But the star of the night was Baby Dainan who is almost 6 months old, he belongs to my cousin Matt and his wife Amanda. The whole family spent at least 30 minutes watching him open his first present and took about 20 pictures! He is just so cute. 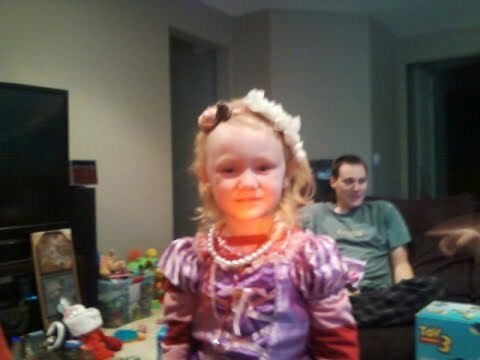 Christmas morning was spent at Keith and Terri's with all of the Urien clan including my super nieces and nephews. Elle modeled the head bands that I made her which turned out pretty awesome in my opinion.